This is one of those cakes that my mum makes quite regularly. It's simple, easy to transport and keeps well, should you have any leftovers for some strange reason. The red wine gives it some depth in flavour and also makes sure it's moist. 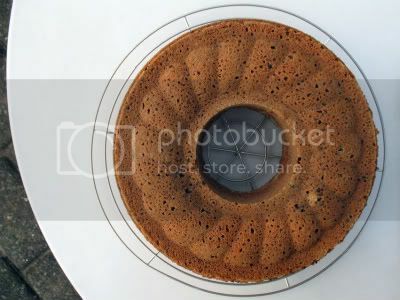 So when I went home for a family visit and all went on a holiday at Easter this cake is one of the things we took along with us and enjoyed with a cup of coffee after a five-hour car journey to East Germany. Why I'm only just getting around to blogging about it now, I don't know! It usually looks a little darker, but we didn't have quite enough cocoa powder left. Preheat your oven to 175C/Gas4. Grease a Kugelhop or fluted cake tin. In a large bowl cream the butter with the sugar until light in colour. Add one egg at the time and continue to beat with an electric whisk. Add the cocoa powder, cinnamon, salt and vanilla essence and red wine and continue to beat until combined. Sift the baking powder and flour together and add little by little by little whilst continuing to whisk. Add the chocolate and mix in with a wooden spoon. 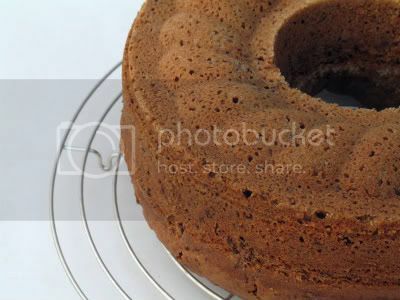 Pour into your prepared cake tin and bake for around 60 minutes until a skewer inserted comes out clean. Allow to stand for 10 minutes before carefully turning out onto a cooling rack. Once cool, dust with icing sugar. Even if you can't cook you can make this tart and impress at a party. I made four of them for the annual Cherry Berry party yesterday, two with thyme and two with basil. There are always so many sweets on offer I thought something savoury would be a good idea. 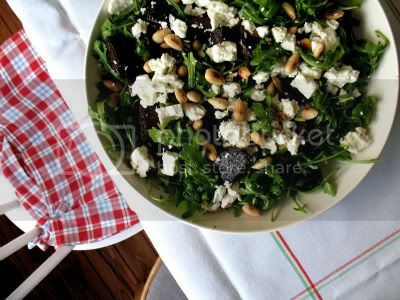 It was great with the Greek Salad that L. had made. A big thanks to L. for organising it this year. I., if you're reading, this is one for you, much easier than cheesecake! Preheat your oven to 180C/Gas4. Cut the large sheet of pastry in half (or you can leave it as one if you prefer/cut it into small individual portions) and score line around all four edges about 2cm in. Crumble 3/4 of the feta cheese over the pastry, leaving the scored edge free. 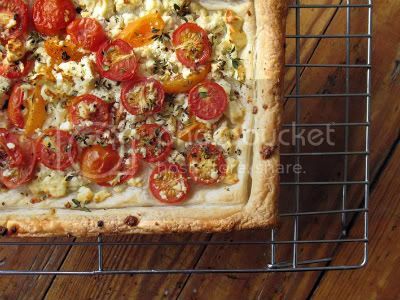 Top with the tomatoes and crumble the rest of the feta over the top. Season with freshly ground black pepper. You won't need salt as the feta is salty enough. Bake for 15 minutes, sprinkle with herbs of your choice and return to the oven for another 5-10minutes until the pastry is golden brown and cooked through.